Russia is experiencing another major brain drain. 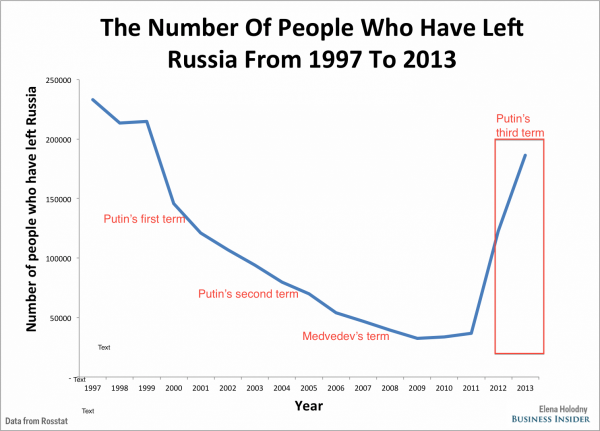 Although emigration trended downward from 1997 to 2011, there was a sudden spike in people leaving the country around the third term of President Vladimir Putin, according to Rosstat, Russia’s federal state statistics service. In 2012, almost 123,000 people left, and in 2013, more than 186,000 got out. Additionally, a UN report showed that 40,000 Russians applied for asylum in 2013 — 76% more than in 2012. The biggest bombshell of all is that since April 2014 — a month after Russia annexed Crimea — 203,659 Russians have left the country. By comparison, approximately 37,000 people left the country in 2011, and less than 34,000 people left in 2010. Furthermore, the emigration numbers may be even higher. “The official statistics are very low,” Mikhail Gorshkov, the director of the Russian Academy of Sciences’ Institute of Sociology told Reuters. What’s particularly interesting is the type of people who are leaving the country. “While the total number of Russians who leave for good remains relatively small, the profile of the typical emigrant has changed. When the Soviet Union dissolved, the most common emigrant was a poor, unskilled young man. Today, it is a well-off professional,” according to World Policy. “People who have it good are starting to leave,” Anton Nosski, a tech entrepreneur, told World Policy. Notable individuals who have left include chess grandmaster Garry Kasparov, economist Sergei Guriyev, journalist Leonid Bershidsky, and the founder of VKontakte (Russia’s version of Facebook) Pavel Durov. For the most part, these people are leaving either for their children or for their professional futures. “Corruption, red tape, and allegedly crooked courts are [also] driving the exodus among entrepreneurs,” according to Reuters. “I want my children to grow up in a fairer country, one where the rule of law is more or less observed. I used think it was possible to build a better society in Russia, but I’ve basically lost all hope now. It’s time to leave,” one Russian businessman told Vocativ. Additionally, Russia’s “creative class” is starting to feel isolated, although some politicians seem unfazed. “Russia won’t lose anything if the entire so-called creative class leaves. What’s the creative class anyway? For me, a woman who gets up at 5 a.m. to milk a cow is creative because she produces something. Not some guy with a stupid haircut who sits in a cafe all day long writing in his blog,” said Vitaly Milonov, a Member of the Legislative Assembly of Saint Petersburg. But the brain drain isn’t the whole story. A huge influx of immigrants are entering Russia as well. This makes sense: If many high-level individuals and intellectuals are leaving Russia, more high-end jobs and opportunities will become available in Russia. Many of the immigrants come from countries like Azerbaijan, Uzbekistan, Ukraine, according to data from Rosstat. Additionally, millennials who are culturally Russian but were born in the US or Europe are considering opportunities in Russia. “There are opportunities for my children in Moscow that aren’t found anywhere else,” one parent told BI. The bottom line: Russia is seeing some dramatic demographic changes that could greatly influence its economic and political future. Too bad Russia is losing so many brains, just because of Putin’s policies . Would have been better if Putin goes , but obviously no one wants him ! !